13" & 15" MacBook Pros Afflicted with Slower SATA? Why Did Apple Limit the SATA Bus to 1.5 Gbits/s in New MacBook Pros? Is Safari as Fast as Apple Claims? SchwarzTech's Eric Schwarz says that Apple surprised everyone at the WWDC with its revised MacBook Pros offered at lower prices, and with a bit of irony he observes that some users are less smitten than others with a few of the changes announced. Eric notes that there are those who slavishly and uncritically go along with every design and marketing decision Apple makes, pointing out that If the latter cohort was in the majority, we'd probably have seen FireWire disappear from the Mac lineup, rather than being restored by popular demand on the new 13" MacBook Pro, while on the balance if the foot-draggers in the Apple user community completely held sway, we would most likely still be using Macs with round serial ports, ADB, and SCSI. Editor's note: A former Low End Mac writer, Schwarz makes the point is that nobody has lost anything! Need a 15" MacBook Pro with an ExpressCard slot? Every version except for the latest has it. Want a matte display? Buy a 15" MacBook Pro pre-unibody, when that was the norm. Need to be able to swap out the battery? Buy a pre-2009 MacBook Pro. Link: My MacBook Pro Doesn't Have a Parallel Port! "Of all the news that came out of Monday's Apple WWDC keynote, one tidbit that didn't get much attention is worthy of note: Apple's refresh of its 13-inch laptop brought back the FireWire port that had been removed when the first 13-inch unibody MacBook shipped last October . . . It's a truly surprising development. Apple has historically been aggressive about erring on the side of removing technologies from its computers early . . . In fact, I thought that other Macs would begin to lose their FireWire. I was wrong." "As someone who had a lot to say about the missing FireWire 400 ports from the last generation of [aluminum] MacBooks, I'm glad to see the return of the FireWire port to the new 13" MacBook Pro. Unfortunately, it seems like a case of one step forward, one step back for the MacBook Pro range, with only the 17" model being equipped with the ExpressCard/34 slot that many users have come to rely on." The Register's Chris Mellor says Apple may have switched to a slower SATA interface with some new MacBook Pros, and notes that the alleged SATA "degrade" shouldn't affect hard disk drive MacBook users, but may well affect users with high performance Flash-based solid-state drives (SSDs). Link: MacBooks Afflicted with SATA 'Degrade'? Hardmac's linathael and Lionel say that Many hypotheses have been expressed to understand why the MacBook Pro SATA bandwidth has been reduced by half, but they do not find any of them valuable. It might also be a bug or a deliberate choice made by Apple to save power and extend battery life. So, with the new MBP, the SATA bandwidth is limited to 130 MB/s according to several tests. In other words, it does not make sense to invest in a ultra-fast SSD delivering 200 MB/s or more in read/write speed on the 13" and 15" MBP. Link: Did Apple Limit the SATA Bus to 1.5 Gbits/s in New MacBook Pro to Save Power? Hardmac's linathael and Lionel report that they just received a 15" 3.06 GHz MacBook Pro and performed some experiments to further investigate the issue associated with the limited 1.5 Gbits/s SATA port. They have confirmed that despite both SSDs tested on it support 3 Gbps SATA II format, they are limited to 1.5 Gbps by the computer. The Queensland University of Technology at Brisbane, Australia, has posted a web page containing health and safety considerations for Apple Macintosh "glass"/high gloss monitor screens, warning that glossy displays could cause the operator to adopt awkward postures when viewing the monitor screen and using related equipment that may in turn lead to an injury. Blogger MacMatte says Apple must offer the matte screen for iMacs and all MacBook (including Air and Pro) models - and contends this is an issue that won't die down with the passing of time. MacMatte argues that glare from glossy screens causes eye strain for many people, and matte screens solve this eye health issue, which he says has to do with the physiology of the human eye, some people being prone to eyestrain when starring for hours at reflective surfaces, although others are not bothered. That said, CNET has bestowed the coveted Editors' Choice award on the new 13" and 15" MacBook Pros. TUAW's Chris Rawson notes that while MacLife and Gizmodo have both reported that Mac OS X 10.6 "Snow Leopard" will add multitouch gestures to all older MacBooks and MacBook Pros, this is incorrect. If you have a MacBook Pro manufactured before early 2008 or any plastic MacBook, Snow Leopard or not, multitouch isn't coming your way. Apple's information on Snow Leopard's enhancements reads, "All Mac notebooks with Multi-Touch trackpads now support three- and four-finger gestures, " which raises the question as to what is the difference between a multitouch trackpad and a regular one, and which models have it? "If you followed the Apple-dominated tech headlines over the past week, then you know that Apple's Safari browser is the fastest web browser you can use at this time. That is, of course, if you believe Apple and its claims about its 'incredible' browser. But is it really the fastest? We ran the software and its rivals through several benchmarks to find out. "The tests reveal that based on results provided by the most common benchmarks, Safari is the fastest browser among the top four today, but subjectively the difference can feel subtle." Link: Browser Wars: Is Safari as Fast as Apple Claims? "After having just returned from the Bonnaroo Music Festival in Manchester, Tennessee I wanted to share a few tips about what to bring if you plan to bring your Mac (and iPhone for that matter) on a camping trip." "Friday afternoon was a perfect example. Having perused numerous Internet-based complaints regarding Apple customer service personnel refusing to repair defective MacBook Air bezel hinges, I admittedly walked into the Reno, NV store girded for a fight . . . [but] As it turns out, I'll be getting an entire replacement display assembly, since the hinge design doesn't allow for standalone repair . . . my representative also implied, in a roundabout way, that Apple was accepting systems for repair even if they were out of warranty (to within a reasonable timeframe)...."
"Secure Digital memory cards based on the new SDXC (extended capacity) specification could be out as early as next year with a capacity of 64 GB, with 2 TB available at some future point, said Kevin Schader, director of communications at the SDA...."
AnandTech's Anand Lal Shimpi has posted one of his thoughtful, analytical, and prolix profiles of the new MacBook Pro line. If you're considering the purchase of one of these machines, or are just interested in them, this review is a must-read. Anand is particularly impressed with the new models' battery life with their new (or carryover in the case of the 17" unit) larger non-swappable batteries. Macworld's James Galbraith reports that just a few minutes into the WWDC keynote address, the reality became clear that he would end up spending a week in the Macworld Lab testing new Macs with six new MacBook Pros to through benchmark tests. Computerworld's Ken Mingis reports that while in the the past, Apple's M.O. has been to add features, bump up processor speeds, and boost RAM and hard drives in its new hardware, usually while holding the line on prices, with the MacBook Pro revisions announced at the WWDC last week time it manages to add power and features and cut the bottom line as well with price drops ranging from 6.3% to as much as 28% across the MacBook Pro line. "Dell has had a long history of ultraportables, but when Apple released the MacBook Air in early 2008, it underscored a wide gap in terms of design: while Latitudes have always been functional, they've rarely been alluring to home (or simply design-centric) users in the way the Air was. The Adamo 13 is Dell's attempt to rectify this with an ultra-slim profile and attention to quality. But is it a case of improving on what's come before or just a Latitude in better packaging? Our full Adamo 13 review hopes to settle this question once and for all." PR: WD has announced that it has begun shipping its new SiliconDrive III SSD product family based on technology from its March 2009 acquisition of SiliconSystems. The company's new SiliconDrive III products feature faster read/write speeds and increased capacities, and offer mechanical scalability, making them a perfect storage solution for embedded system and data streaming applications such as multimedia content delivery systems and data center media appliances. SiliconDrive III SSDs include 2.5" Serial ATA (SATA) and Parallel ATA (PATA) and 1.8" Micro SATA products featuring native SATA 3.0 gigabits per second (Gbps) or ATA-7 interfaces with target read speeds up to 100 megabytes per second (MBps) and write speeds to 80 MBps in capacities up to 120 gigabytes (GB). SiliconDrive III is the first example of how WD plans to productize solid state technology developed by SiliconSystems. The launch of SiliconDrive III will also enable WD to leverage its global sales and distribution channels to accelerate the adoption of SSD technology beyond SiliconSystems traditional embedded systems OEM customer base into data streaming applications such as multimedia content delivery systems and data center media appliances, said Michael Hajeck, senior vice president and general manager of WD's solid state storage business unit. SiliconDrive III is an ideal solution for OEMs that require increased performance, capacity, reliability and data throughput in their applications. SiliconDrive III has been designed and optimized for high performance and high reliability in demanding 24 x 7 applications in the embedded systems, media appliance and data streaming markets. Performance and reliability is achieved through the integration of the company's patented and patent-pending advanced storage technologies in every SiliconDrive III product. The company's patented and patent-pending PowerArmor, SiSMART and SolidStor technologies address critical OEM design considerations such as the elimination of drive corruption due to power anomalies, the ability to monitor a SiliconDrive's useable life in real-time and integrated advanced storage technologies that ensure data integrity and SSD life for multiyear product deployments. PR: At a mere 1 lb., the Go! Travel Keyboard allows road warriors and mobile professionals to safely work wherever their jobs take them, and, enjoy all the benefits of the standard Goldtouch when away from their office workstations. With keys approximately the size of those found on 14" notebooks, the Go! Travel Keyboard can accommodate large fingers and offers similar key feel and travel distance as found on the standard Goldtouch. 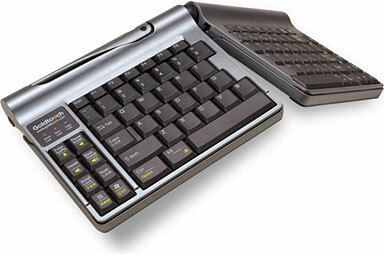 Other "mini" or "compact" keyboard have key travel that is too short or hard, and causes significant pain from bottoming out. Soft key touch, low activation force and full key travel distance provides keying comfort and reduces risk from "bottoming out" when keying. PR: New for 2009, the Goldtouch Go! Travel Notebook Stand is a sleek, lightweight, and effective way for road warriors and mobile professionals to avoid neck injury from improper notebook monitor height. Road warriors and conference room executives now have a safer way to work with the new Goldtouch Go! Travel Notebook Stand! Made from aluminum for strength and high aesthetic appeal, the Go! 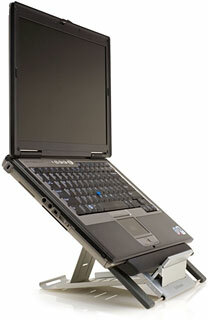 Travel Notebook Stand offers five settings for proper notebook monitor height adjustment. For ease of use and portability, it also collapses compactly into its own neoprene cover, which can be used as a mousing pad to reduce contact stress on the work surface. Available in multiple colors, the Go! Travel Notebook Stand can accommodate notebooks up to 17". PR: Deskology has relaunched with the DeskSet, a set of high-end simple and functional desk accessories designed for use alongside Mac computers. The DeskSet designed to compliment your Mac computer right down to the finish. 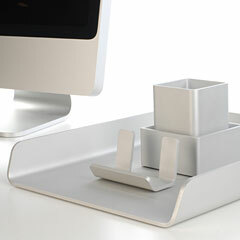 These carefully crafted accessories will add a level of substance to your desk space that no other desk accessory can. The DeskSet has been designed with simplicity and functionality in mind. 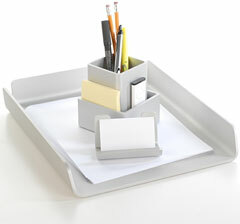 The DeskSet consists of an inbox tray, pencil cup, doodad cup and business card holder and sells for $189; all pieces are also available separately. All pieces are constructed of 3/16" thick anodized aluminum material with a matte anodized finish. Laser-etched cork is used on the underside to reduce sliding and provide contrast to the aluminum material. Shipping is automatically applied to all orders that are within the USA. Products are expected to ship late-June. As part of their relaunch, free shipping is being offered for a limited time with products expected to ship in 2-3 weeks. Deskology is a small Seattle-based company specializing in creating simple and functional accessories for the desk space. PR: Kingston Technology Company, Inc. has announced the release of the DataTraveler 200 (DT200), the world's first 128 GB USB Flash drive. The large capacity along with password protection gives users the flexibility to carry critical data with them at all times in a very small form factor. 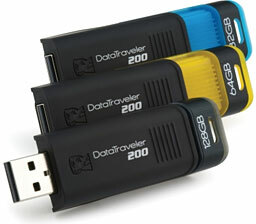 The Kingston DataTraveler 200 features a capless design to protect the USB connector when not in use and is enhanced for Windows ReadyBoost. It is available in 32-, 64- and 128 GB capacities. The 128 GB drive is build-to-order only. Customers who wish to purchase it can place an order through normal channels (e.g., e-tailers or resellers). For more information, visit kingston.com or call 800-337-8410. PR: Other World Computing (OWC) has announced OWC DDR3 1066 MHz Memory Upgrades up to 8 GB for the new 13", 15", and 17" MacBook Pro models that were announced Monday, June 8th at Apple's Worldwide Developer Conference (WWDC). OWC Memory Upgrades offer new MacBook Pro model owners savings of up to 42% and upgrade options not available from factory, plus OWC's Lifetime Advance Replacement Warranty and Money Back Guarantee. Add to the existing 1 GB factory chip in MacBook Pro 2.26 GHz model for 3 GB of total memory. This upgrade is only available from OWC, not available as a factory option. 32% lower cost than factory 4 GB upgrade for MacBook Pro 13" 2.26 GHz model. Replace an existing 2 GB Factory Module to have 6 GB of total memory. This upgrade is only available from OWC, not available as a factory option. This upgrade kit is only available from OWC, not available as a factory option. Unlike factory memory upgrade options, when you add memory from OWC, you retain the factory installed base memory modules. You can choose to simply keep these modules (possibly for use in another Mac), or opt to send them in to OWC for additional cost benefit with trade-in rebates available of up to $38 for a 2 x 2 GB set. OWC also offers 7200 RPM internal hard drive upgrades at a savings of up to 25%. Upgrade prices start at $74.99 for a 250 GB 7200 RPM hard drive. The most popular model, the OWC 500 GB 7200 RPM internal hard drive, is priced at $149.99, up to $50 less than the same size factory installed upgrade. In addition, Solid State Drive (SSD) upgrades up to 160 MB are available priced starting at $347.99. MacBook Pro new model owners upgrading to an OWC internal hard drive can either send their original MacBook Pro hard drive to OWC for a cash back rebate of up to $50 or have the option of keeping the factory drive and/or installing it into an OWC enclosure, such as the OWC Mercury On-The-Go Pro FireWire/USB 2.0 or the OWC Mercury Express USB 2.0 from $19.99 for additional external storage. OWC memory upgrades are available from 16 MB to 32 GB for nearly every current and past Apple notebook and desktop computer manufactured during the past twenty years, including Mac Pro Xeon, iMac, PowerMac, Xserve, iBook, and PowerBook computers. By maintaining an active state-of-the-art test lab, OWC ensures its memory upgrades offer the highest product quality and reliability and backs them with a Lifetime Advance Replacement Warranty and Money Back Guarantee. OWC's independent memory benchmarks testing on a wide variety of Mac computers consistently demonstrates that having more memory provides higher real-world performance. OWC memory performance gains are even more apparent when using memory intensive applications, such as audio/video, photo, 3D modeling, gaming and other applications, where OWC memory upgrades offer the best performance for the investment. The full OWC Memory line, as well as a compatibility guide for the correct upgrades for each specific Apple model, can be found online. 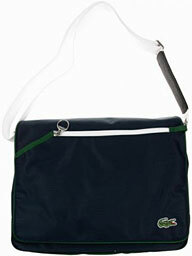 Messenger/Laptop Bag Dimensions: 16" X 5' 12"